Discussion in 'The Lounge' started by muddy beast, Dec 22, 2007. So I learned a valuable lesson today...torque your bolts properly! I went to my shop to pick up my front hub from my big hit that I left there over the week. Basically, I cut all the spokes off my wheel to get the hub(my first problem), then realized the disc was still on there...well when I went to take the bolts out only one would come out, and I stripped every other one trying to get it off. So I left the hub for one of the senior mechanics to fix for me, well, he did...but he destroyed 2 easy-outs and drill bit trying to get them. Literally the heads of the bolts fell off before the threads would come out. Moral of the story, I have a perfectly good hub and disc to use to build the new wheel but after a lot of pain and suffering for my co-workers, and I'll never tighten a bolt to much after putting loctite on it (yes, the blue kind). That's also very true........but think about it for a second. He learned NOT to tighten bolts with Heman strength. Once you get a knack for how tight things are suppose to be then you'll know when you've gone too far. Measuring things in inch pounds vs. foot pounds as far as torque goes is a HUGE difference. Rotor bolts are one of those bolts on a bike that I can say are probably over-torqued by most. Think of the size of the bolt.........it doesn't take much to snap that. The right tools make the job easier, but also learning how to use them can be the most beneficial to using tools in general. I imagine. Try tightening a rotor bolt to 55 foot pounds and you'll either pop the head off or strip the threads in the hub pretty handily. Yup. I alway torque mine to spec and they never come loose and never get stuck. There are specs for tightening bolts? I bet ladies can torque it right. Why didn't your mechanic just cut the bolt heads off and remove the rotor? He could then just take some vise grips and back the nubs out. Takes 10 minutes. 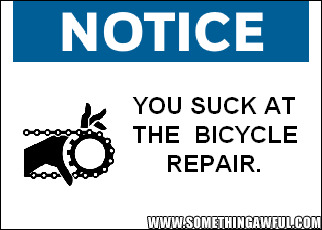 Amazing how many people on a biking BBS don't know a bloody thing about bikes/mechanics. Pivot bolts on a santa cruz superlight are tightened to 75 inch pounds not foot pounds. When in doubt use a really big hammer. I recommend at least a 3llb forging hammer. And remember people, if blood is not squirting from your finger tips, then you're not doing it right. Think about it...the bolts were stuck because of loctite and they were stripped. If he broke tools getting the bolts out with the heads still there, how would he have gotten them out without destroying the bolt holes themselves? I still wanted the hub to build the wheel, and I trust his 30 years of experience. It wasn't that I don't know what I'm doing...more that I wasn't thinking. I mean it was just some bolts, and I didn't want them to come out (like they'd been doing, even after loctite) at whistler, and when I went to take them out, I figured if one comes out why wouldn't at least a few of the others? Either way...I really need a torque wrench so I can get the "correct" torque. Thats a funny story, I am curious how that with just "Blue" loctite you could not remove the bolts from your hub. Seeing how most every rotor bolt comes with "Blue" loctite already applied. More like you cross threaded them on the way in in the first place, that or you started pulling the threads in the hub while over tightening the bolts in the first place. We have a new guy working for us in the Bike shop, Lets just say I am glad he is in sales. I was installing my New hussefelts the other day and he thought he was going to be able to make fun of me for using a tourque wrench when I installed my pedalls. Everyone else in teh shop knows better already. Rule of the shop is, If you can put a tourque wrench on it, find the spec and do so. Oh and MB, yes yiou need a tourque wrench, possibly a pair of them, one that reads in lbs and one that reads foot lbs. except that time you broke the lowers on your 888 like a billionty times? That because the 888 are made of cheese. Do you know what Vise Grips are??? If you drill the head off, you just use the pliers to lock on and back them off. If a mechanic of 30 years couldn't figure that out, he should call it good at 30 and retire. I have never not been able to get the bolts out of the hub by backing it out by the nub(s). I can usually get the stripped out boltheads out without a easy out or a drill too And what kind of loctite are you using? Then how would I build the wheel back up? Yeah, he put it in a vise grip. The worry was, was that it would crush the hub for him to be able to tighten it enough to get them out but he made it work. Its sounds pretty stupid, but these bolts were not going anywhere, and pliers wouldn't have done ****...the reason they stripped was because they didn't want to come out. They were jammed damn good. And I didn't cross thread them because I'm smart enough to rotate the bolts backwards till it clicks and then turn it in. You'd had to have seen the hub and tried to get the bolts out your self to know how tough it was. There's a first for everything...it was super old blue. I think it was a combination of torquing them WAY to much and have a good amount of loctite on. 1) chisel a small guide hole right in the middle of the bolt remainings. 2) drill a hole with a drill bit 1/2 the width of the bolt. Seriously, I am glad you learned you need a tourque wrench, but the more I hear, the more I am not willing to belive you used just blue loctite. Sorry but you either used Hi strength, or you cross threadded the bolts in the first place, another reason you want a tourque wrench, and yes your hub is soft enough of a metal you can put your bolts all teh way in crossed, but if you use a tourque wrench then youll know way before your stuck. Broekn/stuck/stripped bolts, are not that hard to removespecially after you remove the heads, like most everyone has said, from thre you just grab it with some vice grips, if your going to crush the hub witht eh vice grips, LEARN WHAT TO GRAB, your grabbing the bolts not the hub. Rule of the shop is, If you can put a tourque wrench on it, find the spec and do so. It was blue, I know that for a fact because its the only one I have, and I use it all the time...the color remains blue. As for removing them...the torque wrench was pretty new. And I know how this sounds from an outside view, its ridiculous, but I remember not only spending a good amount of time to get them as tight as I could so they wouldn't back out later, but how could 5 bolts all have gone in wrong and stripped? I've been doing mild work like this on my bikes for 4 years and never had that problem. And there are tons of ways to remove the bolts that could work it all just comes down to who's taking them out and their preferred method. I use my T wrench like it is religous experience, although racing full time has got me into a routine but it does help, after a while you know all the specs off hand and get to know what it feels like by practice. Like he said but in teh english! Then how would I build the wheel back up?. Um...He cut the spokes off the hub. I was wondering when someone was going to catch that. Do you think he loosened them first or just started cutting?